NEW YORK (CNNMoney) -- Shares of Apple reached $600 for the first time on Thursday, setting yet another milestone for the stock market's most valuable company. The stock hit $600.01 moments after the market's open before quickly falling back below that level. Shares closed down 1% at $585.56. Apple's (AAPL, Fortune 500) stock price growth has risen for the past three years, boosted in particular by record sales of the iPhone and iPad. The much-hyped third-generation iPad is set to go on sale Friday. It was almost exactly one month ago that Apple cracked the $500 level for the first time. 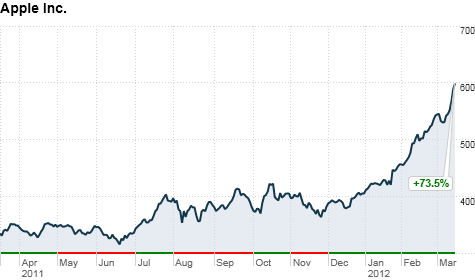 Apple passed the $400 level for the first time seven months earlier, and it's been just 17 months since it passed $300. Shares traded above $200 for the first time in October 2009. At $600, the combined value of Apple's outstanding shares is more than $559 billion, the third-highest valuation ever for a public company. It now only trails General Electric (GE, Fortune 500) and Microsoft (MSFT, Fortune 500), which both soared to around $600 billion during the dot-com bubble at the turn of the century. Apple's valuation is huge, but analysts say that the fundamentals back it up. Despite its monumental rise, Apple's stock is still trading at just 14 times its expected earnings per share for 2012. That's relatively cheap, considering that the tech-heavy Nasdaq 100 trades at about 18 times future earnings. Last quarter, Apple posted $13 billion in profit. It was one of the most profitable quarters ever for any U.S. company, trailing only ExxonMobil's (XOM, Fortune 500) record-setting $14.8 billion quarter from the fall of 2008, when oil prices were at an all-time high. Analysts attribute the stock's recent rise primarily to Apple's outstanding iPhone sales. Apple sold 37 million of the devices last quarter, and early indications are that the phones are continuing to sell well this quarter across the globe. Investors are also investors buying into the belief that Apple will soon have a dividend. The company has nearly $100 billion in cash sitting around, and CEO Tim Cook has hinted that he's willing to part with some of it. "Some of money that got put to work starting late last year was from investors that want dividend," said Alex Gauna, tech analyst at JMP Securities. "That's how this whole thing got started. But lately it's been all about the iPhone."